To make muffins: Place a rack in the middle of the oven and preheat to 400°F. Butter and flour twelve 2 3/4-inch, 1/2-cup capacity muffin tin cups or place a cupcake liner in each cup. In a medium bowl, combine flour, sugar, almonds, baking powder, baking soda, salt and cardamom, if using. In a large bowl, whisk together eggs, yogurt, melted butter, orange zest and vanilla; add flour mixture, stirring until just combined. Transfer batter to prepared muffin cups; bake until light golden brown and tops spring back when lightly touched, 20 to 25 minutes. Transfer to a wire rack to cool slightly. 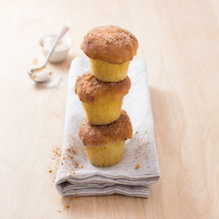 To make glaze and finish muffins: In a small bowl, combine cinnamon and sugar. Place melted butter in another small bowl. One at a time, remove warm muffins from the cups and dip tops into melted butter, then into sugar mixture. Serve warm or room temperature. Makes 12 muffins.